During September 2001 the third season of excavations was conducted at ‘En Qobi (Permit No. A- 3489*; map ref. NIG 21121/62600; OIG 16121/12600; HA-ESI 117, HA-ESI 118). The excavation, carried out on behalf of the Antiquities Authority and sponsored by the Jewish National Fund, was directed by B. Zissu and D. Weiss, with the assistance of A. Ben-Nun (area supervision), V. Essman and V. Pirsky (surveying), N. Davidov and T. Sagiv (photography), J. Abu-Diab, V. Bitman and M. Avrahami (conservation), N. Zak (drafting) and Z. Greenhut, J. Seligman and D. Amit. Additional assistance was provided by G. Bashan, H. Tsoref, G. Avni, N. Malka and I. Rotline of the Jewish National Fund. During this season, excavations in the water conveyance system near the spring and in the church were conducted. The water conveyance system was hewn to trap the spring water and control the flow. This spring is a seep, which emanates from the interface between the dolomite bedrock of the ‘Aminadav Formation and the Moza marl aquifer. The water system began in a vertical shaft (diam. c.0.8 m, depth c. 6 m) that was cut from surface to the spring. A hewn conduit (length c. 17 m, width 0.5 m, depth c. 1 m), covered with stone slabs, led northward from the spring to a subterranean collecting hall (5 × 11 m; Fig. 2). Rock-cut steps descended to the hall, which had a barrel-vaulted ceiling. The bottom part of the walls in the hall was lined with large ashlar stones whose interstices were filled with gray mortar. Among the several layers of plaster that were applied to the walls, the bottom one was gray and characteristic of water installations at the end of the Second Temple period. The upper part of the walls and the ceiling are today lined with small stones and modern cement. A square aperture in the middle of the ceiling allowed light inside the chamber and was used for drawing water. The hall was divided into a southern and northern part. The southern part (5.2 × 5.5 m, max. depth c. 2 m), c. 1 m lower than the northern part, was meticulously plastered and used for storing water. Close to its bottom, water spouted from a small recess, which was installed at the base of the hall’s eastern wall, using some dismantled stones from the lining. The flow of water was perennial and filled the pool during arid seasons. A rock-hewn channel at the bottom of the higher, northern part conveyed the surplus water collected in the southern part northward, to another hewn tunnel. A small irregular-shaped chamber at the beginning of this tunnel was originally perhaps a natural subterranean cavity. Its ceiling was shaped as a pointed vault at whose top was a square hewn shaft, lined with dressed stones, which allowed light and air into the chamber. The stone-slab covered tunnel (length c. 17 m, width 0.4 m, height 0.7 m) was north-bound and at its northern end, a chamber of concrete and small stones with a square aperture in its ceiling was built in modern times. At the end of the tunnel the water flowed in two directions: eastward, to a sabil within a modern building that was accessed by steps and northward, to a stone trough that was probably meant for watering sheep and goats. A built channel covered with stone slabs emerged from the eastern end of the trough and conveyed water to an open trapezoidal collecting pool (7 × 7 m, depth c. 1.8 m, width of walls 0.8 m), which was built in the Qobi stream gulley. The pool was carefully coated with numerous layers of hydraulic plaster that indicated its prolonged use. The water flowed to the irrigated cultivation plots in the Qobi streambed through an opening at the bottom of the pool’s northern wall. A built channel visible in the center of the streambed was mainly intended for draining surface runoff. During the 2000 excavation season, another channel (min. length 300 m, width 0.3 m, depth 0.3 m), hewn along the western slope of the Qobi stream and connected to the water conveyance system, was exposed. Water flowed to the cultivation plots in the streambed through openings in the channel’s walls. 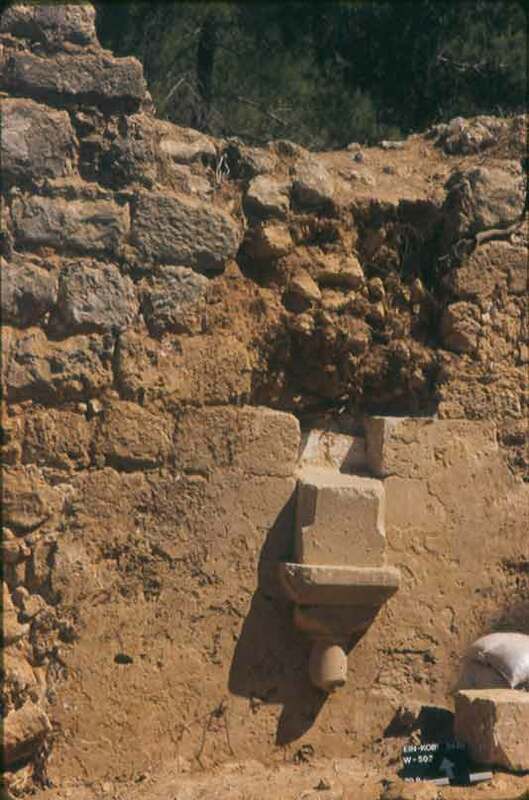 A square maqam with a dome on its top (Esh Sheikh Ahmad el-‘Omari) was documented near the outlet of the water conveyance system. The structure was built of ashlar stones in secondary use and a mihrab was constructed in its southern wall. A column in secondary use was incorporated in the exterior southeast corner of the building. The water conveyance system was used for a very long time, undergoing numerous repairs, the last phase of which was carried out during the British Mandate era. These repairs were well integrated into the system and sometimes incorporated ancient building elements in secondary use. Therefore, it is difficult to date the system without dismantling its components and excavating probes. An examination of the plaster composition from the different phases may aid in dating the various components. It is assumed that the initial phase of the system can be dated to the Second Temple period and most of the system’s components belong to this phase, with the exception of the vaulted cement ceiling of the subterranean collecting hall, the sabil and the trough at the water outlet. Similar water conveyance systems were found in other springs in the Judean Hills, among them ‘En Zova, ‘Ein Handaq, Sataf, ‘En Ya‘el, ‘Ein el-Hanniya, ‘Ein el-Hadaf and Battir. 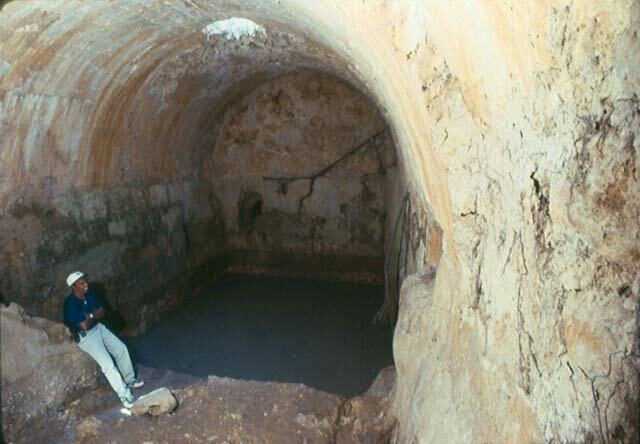 The Wadi el-Biyar aqueduct in the northern Hebron Highlands, which constituted part of the water-supply system to Jerusalem during the Second Temple period, comprised tunnels that impounded spring water (T. Tsuk, Y. Miron and K. Wolovelsky, 1986. Survey of the Biyar Aqueduct. Niqrot Tsurim 13:109–129 [Hebrew]; A. Mazar, 1989. 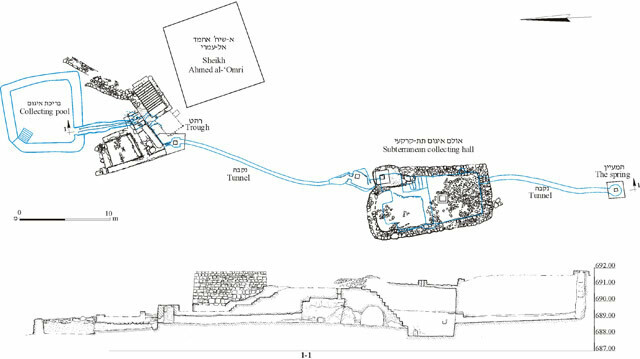 A Survey of the Aqueducts Leading to Jerusalem. In D. Amit, Y. Hirschfeld and J. Patrich [eds.]. The Aqueducts of Ancient Palestine. Pp 169–195 [Hebrew]). The resemblance of these water systems shows that the Judean population was able to utilize the aquifer water and convey it via tunnels to collecting pools, as early as the Second Temple period. The church was constructed on the slope of a mountain, c. 50 m east of the spring. It was documented in 1873 by the British surveyors of the Palestine Exploration Fund who dated it to the Crusader period (Conder C.R. and Kitchner H.H. 1883. The Survey of Western Palestine: Memoirs. Vol. III: 25, 100). The church was also briefly documented by Bagatti, who provided archival information about an unpublished survey conducted by M. Gisler in 1939, who dated the church to the Byzantine period (Bagatti B. 1983, Antichi Villaggi Christiani di Giudea e Neghev, Jerusalem, p. 26, Fig. 8.1). The most comprehensive survey, on behalf of the British School of Archaeology in Jerusalem, was performed in 1981 by D. Pringle (1998. The Churches of the Crusader Kingdom of Jerusalem, A Corpus, Vol. II, pp. 156–157, No. 62. Cambridge), who focused on the plan of the structure and its details and stressed the secondary use of stones, whose diagonal stone dressing characteristic of the Crusader period, was not discerned. 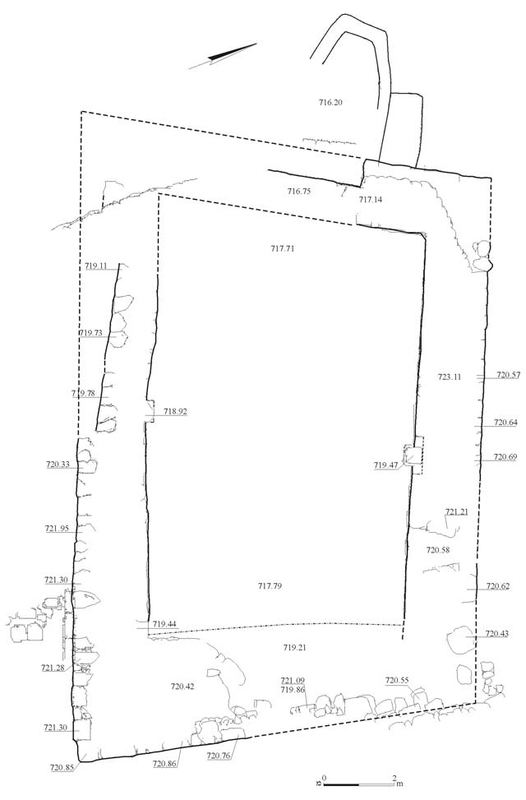 The excavation of the church revealed a rectangular hall, oriented east–west (11.6 × 16.0 m). The exterior face of the walls (width c. 1.9 m) consisted of horizontally-set ashlar stones and the interior face was composed of fieldstones and debesh (max. preserved height 6 m). The entrance to the church (width 1.8 m) was installed in the middle of the western wall; the threshold and one of the doorjambs survived in situ. Several stones that belonged to the sill of a window frame were preserved in the eastern part of the northern wall. The inner apse of the church (radius 2.0–2.5 m) was set in the eastern wall, although it has not yet been exposed. The church was covered with two cross vaults that were supported by elbow columns (Figs. 4, 5), which were incorporated in the middle of the two longitudinal walls. The column capitals were decorated with schematic floral patterns. Such columns were particularly widespread in Jerusalem and its environs and apparently, were prepared in a Jerusalem workshop; they provide an exact date for this phase of the church in the first half of the twelfth century CE (Grabiner E. 1999. The Elbow Column: An Original Crusader Creation. In S. Rozenberg, Knights of the Holy Land, The Crusader Kingdom of Jerusalem, Jerusalem, Pp. 163–169 [Hebrew]). The smooth, light colored plaster, which coated the inside surface of the church walls, corresponded to the elbow columns; hence, the plaster was contemporary with the columns. 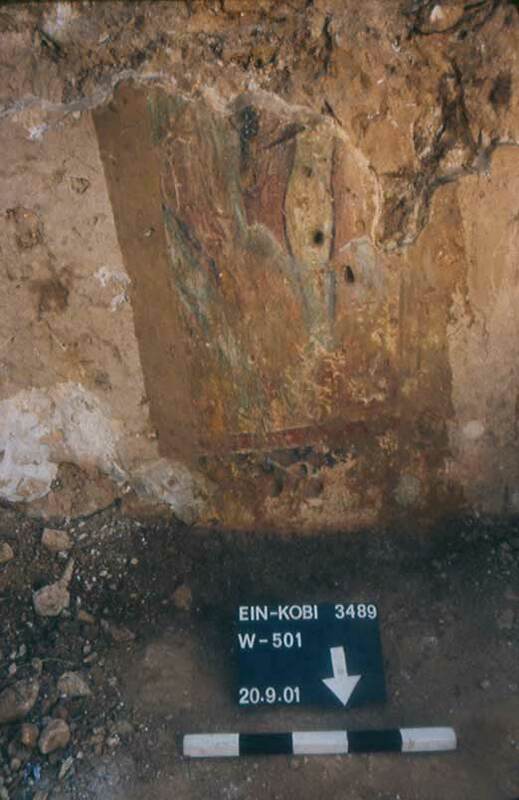 Small sections of plaster, adorned with polychrome frescoes, were exposed in the northern and southern walls. They had undergone preliminary conservation and were covered to prevent damage to the plaster and paintings. A standing figure is depicted in the painting on the northern wall. It is dressed in a red robe and holds an elongated handle in both hands (Fig. 6). Another shorter figure, whose back is turned toward the standing figure, is probably positioned in front of it. 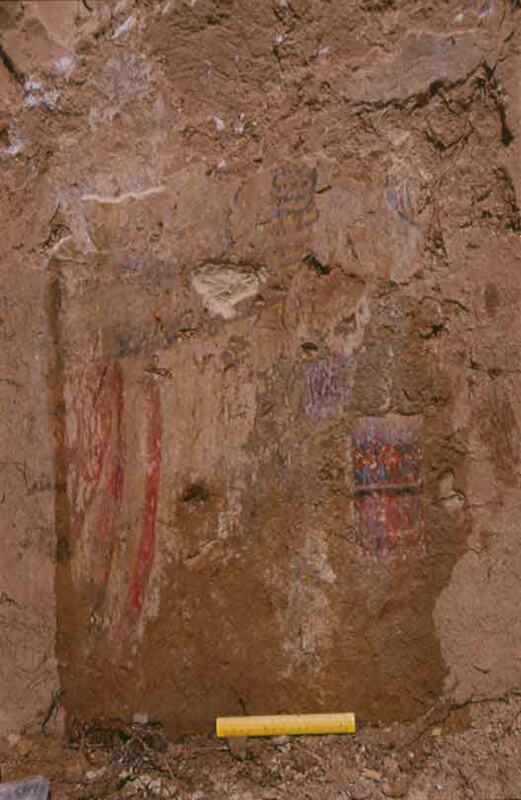 The painting on the southern wall shows the foreleg of a walking animal (a mule or donkey) and alongside it, the bottom part of a human figure, facing forward and wearing a short red garment, ending above the knee (Fig. 7). The animal’s leg and the bottom part of the figure’s leg were covered with a light green paint. This may be a portrayal of a scene known from the New Testament, depicting Mary, the mother of Jesus, going to Bethlehem, or a scene of the holy family on their way down to Egypt. Practically no wall paintings from the Crusader period had survived in the country. To date, five other buildings from this period that have in situ wall paintings, are known, including the Church of Nativity in Bethlehem, St. Jeremiah’s church in Abu Ghosh, the Theoctistus monastery in Nahal Og, in the Judean desert, the Chapel of St. John the Baptist in Sebastia and the church of Gethsemane in Jerusalem (Boas A. 1999, Crusader Archaeology: The Material Culture of the Latin East, London and New York, pp. 205–210, and further references therein). Modern fill that consisted of soil and stone clearance was excavated in the church to a depth of c. 2 m, yet the floor level has not been reached. The church had apparently two phases of construction, the first in the Byzantine period and the second in the Crusader period. The building was renovated in the second phase; ashlar stones in secondary use, probably from the Byzantine period, were incorporated in its walls and the ceiling was rebuilt of vaults that rested on elbow columns. Other churches from the Crusader period that have a similar plan are known in the Judean Hills, e.g., Khirbat ‘Ein el-Kanisa, ‘Ein el-Ma‘mudiya, Horbat Tannur (‘Allar as-Sufla) and Bethphage (Pringle D. 1993. Crusader Kingdom of Jerusalem, A Corpus, Vol. I, Cambridge, pp. 27–30, 47–51, 157–160). Remains of buildings, mostly covered over with earth, were visible to the north and near the church. The buildings and the church adjacent to it were connected to the activities in the vicinity of the spring and possibly also to an ancient road that went up from the Shephelah to Jerusalem. 1. 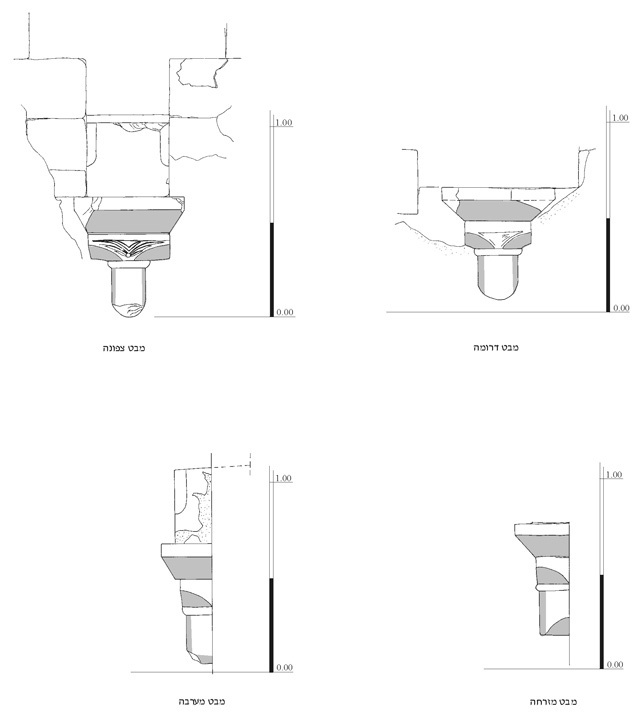 The water system, plan and sections. 2. The subterranean collecting hall in the water system, looking south. 4. Views of the elbow column bases. 5. An elbow column in the northern wall of the church, looking north. 6. A wall painting depicting a standing figure. 7. A wall painting showing a figure’s leg (on the right side) and an animal’s leg.